It's that time of year again: gyms are a little more crowded, wallets are a little slimmer, and there's a higher-than-usual amount of leafy greens in the fridge. We're talking about resolution season of course, and what better way to keep your resolution in check than with the help of your favorite neighborhood park? Winter tends to be a tough time to find resources to help you achieve your goal, so we've put together this list of winter resources in the park to enable you to stay on track. 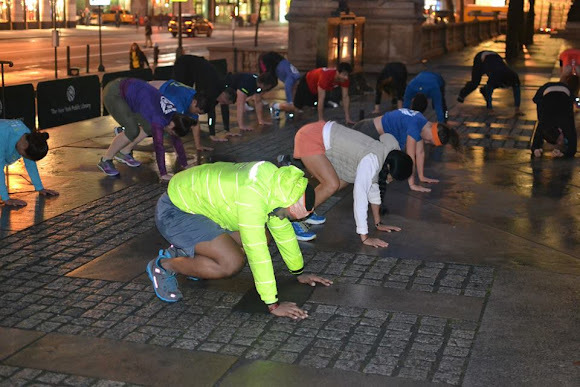 Starting and staying active is now easier than ever at Bryant Park. With dozens of free fitness classes and other activities, there's something for everyone. Ice Skating at The Rink at Bank of America Winter Village is both free-admission and easy on the joints. The Rink is open until March and with the help of some pro tips, grabbing a quick morning skate is easy. Kick-start your day with The Rise NYC Bootcamp at Bryant Park. Tone up before work with crunches, squats and more. You'll be feeling rejuvenated all day long. Did you know that juggling burns 280 calories an hour? It's a good thing we've got daily lessons so you can sneak in a quick and fun workout during your lunch break. It's not too late to register for The Pond Hockey Classic. Grab yourself and two of your buddies and show of your ice skills in this one-of-a-kind open air tournament. The Rise draws a crowd year-round and in all weathers. It's not always easy to get outside your comfort zone and learn something new, but with so many unique and free classes right in your backyard, there's little excuse not to stop by and learn a new skill. Bring a friend or challenge a stranger to ping pong, one of the park's most popular activities. Learn and master the obscure sport of Curling right in the middle of NYC during Winter Carnival. Join us in the park for free public tours outlining the history of the park and its' relationship with the city. You can learn to play ping pong, and you might just learn that you're good at it too! Sometimes self care is the best resolution, and that comes in many forms. Whether indulging in savory delights at the park's restaurants, or taking time to enjoy a moment with your family and friends, Winter Village is the perfect place to take time for yourself. Enjoy a meal our our seasonal pop-up restaurant, Celsius, and be rewarded with panoramic views of The Rink. Stop by park mainstay the Bryant Park Grill for new American fare in a classic Parisian garden setting. Take a spin on Le Carrousel, our park carousel styled in a French classic facade, and create lifelong memories. At Bryant Park, we pride ourselves on the hundreds of free events year-round. 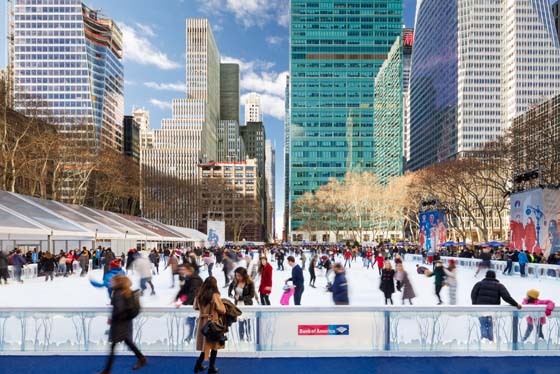 New York's only free admission ice skating rink is located in the park until March. Sign up for our Winter Village loyalty program Polar Perks and enjoy rewards for frequenting the park. Hurry into Winter Village before the kiosks close on January 3rd for some end of season sales. We're always churning out new and exciting free programs, so be sure to check out the events calendar for updates on future programs. It's way too easy to get caught up indoors, especially when in New York "the outdoors" usually means crowded and loud sidewalks. Make Bryant Park your winter escape. Heatlamps at the Southwest Porch provide the perfect environment to get cozy while enjoying some fresh air, which is hard to do in the dead of winter. Take advantage of our free park wifi, and make Bryant Park your home office. The winter is a peculiar time for people watching. Our iconic movable bistro chairs provide the best vantage point to observe fellow parkgoers.